Ahh, the Sea Beach Inn in Ft. Lauderdale. 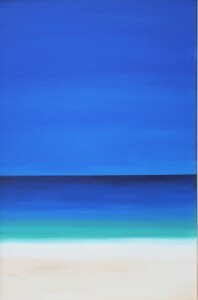 (This painting was called Sea Breeze until I realized I had the name wrong. It was 2004 the last time I stayed there) A little gem of a weekly motel a block from the beach. small pool, small TV, small prices. Walking distance to Bahia Mar Marina, International Swimming Hall of Fame, and the classic bars of Where the Boys Are. There is a great story about washing up on the east coast of Florida called Open Boat. Painting of Beach, Ocean and Sky. 24″w x 36″h acrylic on canvas. Pine frame. This entry was posted in Beach, Horizons, Vistas.